Well with Simply Colorful 1 (RED, ORANGE, YELLOW) hitting stores in just a few short weeks (ahem, and our V and Co. AURIFIL threads too! 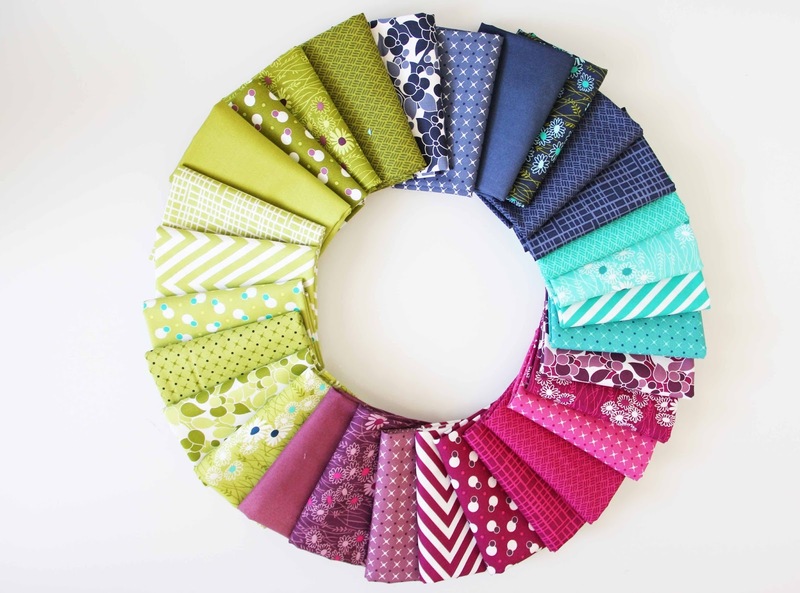 ), I wanted to get you excited for the next 4 patterns that go with the next line of Simply Colorful 2 (GREEN, BLUE, PURPLE)!! 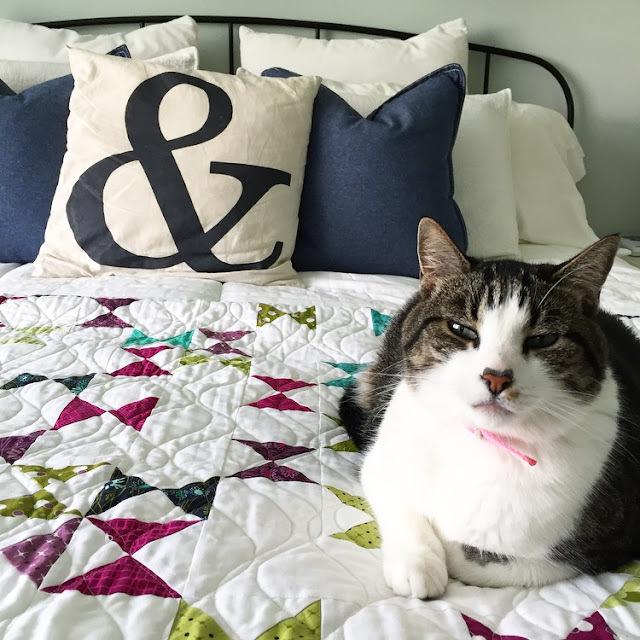 I've been wanting to show off these new patterns for a while now! And here they are! yay! 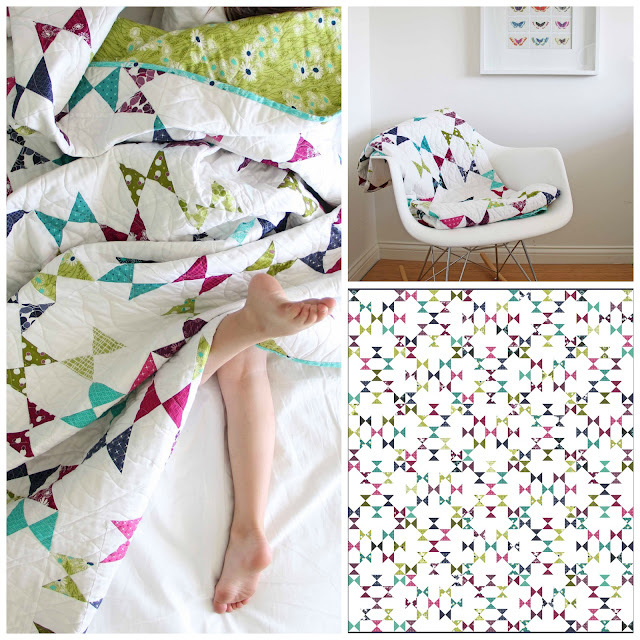 Four new patterns are now available in the V and Co. Shop. 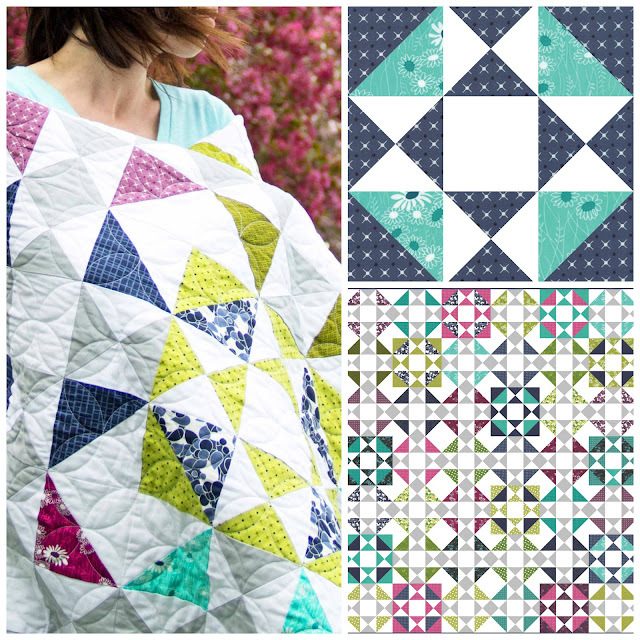 there's also a store wide sale in celebration of our new patterns! 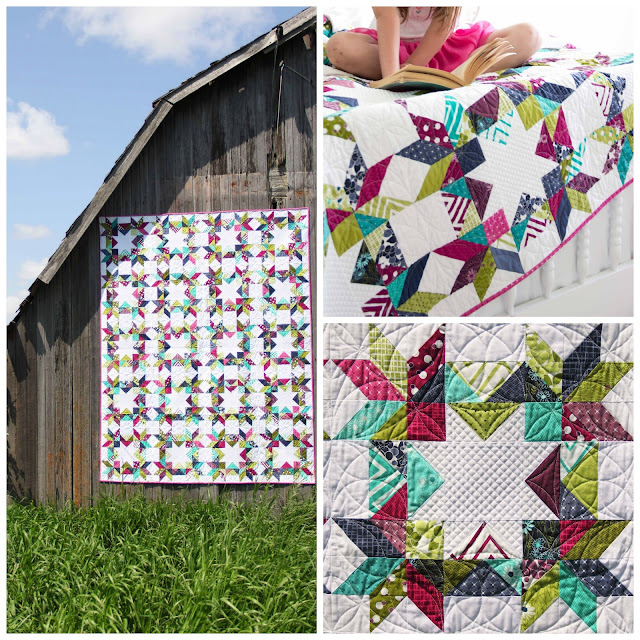 Simply Colorful 2 will ship to quilt stores this September 2015…but that doesn't mean we can't start making these new patterns in other fabric lines or lovely saved up stashes! Finished size featured on the cover: 72" x 84"
It's Fat Quarter friendly, and is a great fun fast pattern to put together. 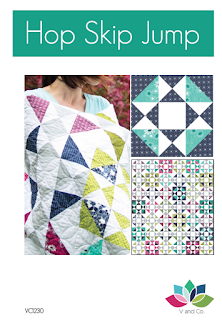 This pattern comes in booklet form, with easy to follow step by step instructions, color illustrations, diagrams, and layout. 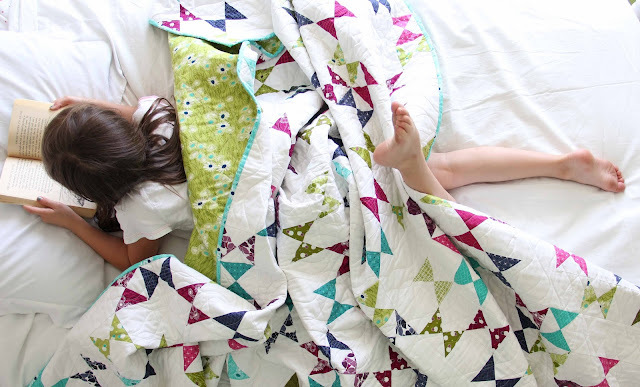 This quilt is a great and easy to make quilt. 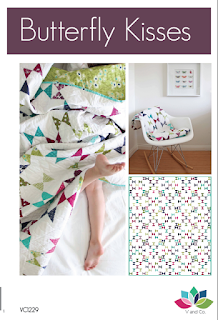 The finished size on the cover measures: 64" x 80"
2 Additional quilt sizes included of throw and baby in the pattern. 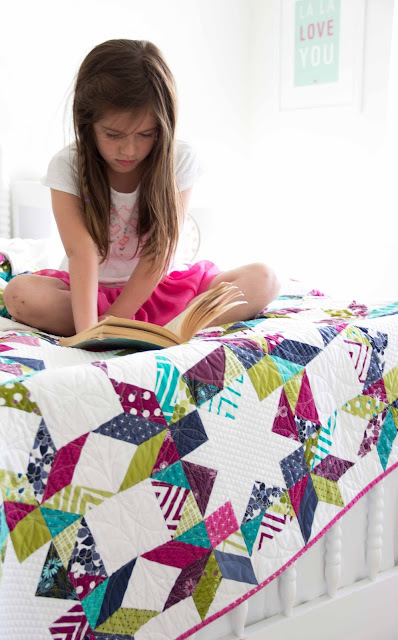 This quilt is a GREAT scrap buster! Need to use up a lot of those scraps you've been holding onto? Here you go you're welcome. 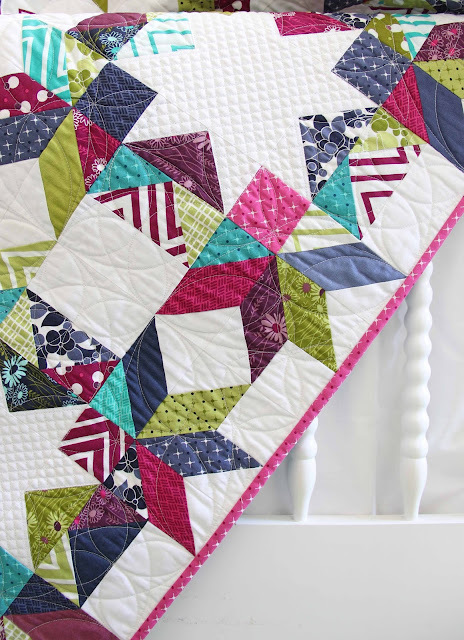 Each block consists of different fabrics so you can use as many of those favorite scraps you have been hoarding for the right project :) this is one of my favorite quilts! I can't wait to make another one using different color placements to see the different feel it gives! 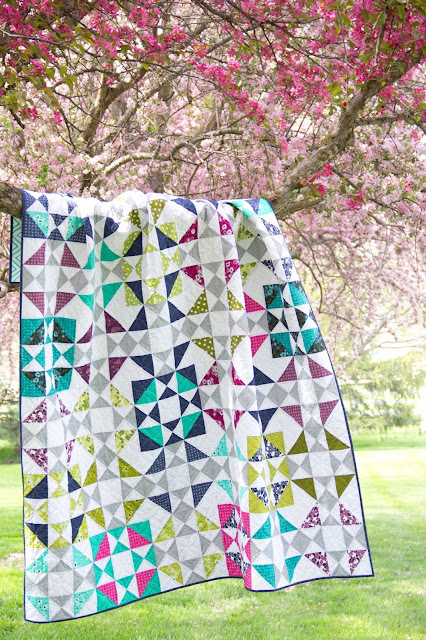 This is just a lovely airy quilt that looks like you are being surrounded by Butterflies! 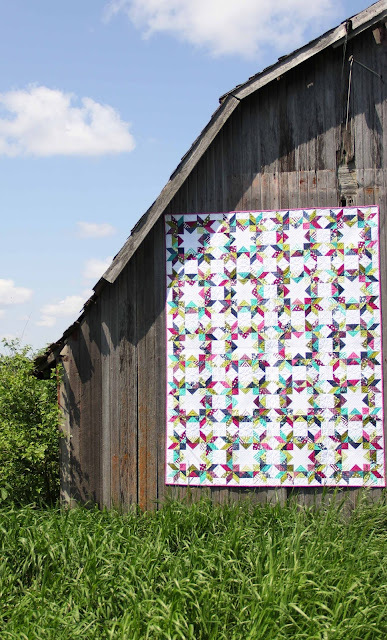 The quilt featured on the cover is 75" x 90"
Purchase Butterfly Kisses Quilt PDF here. 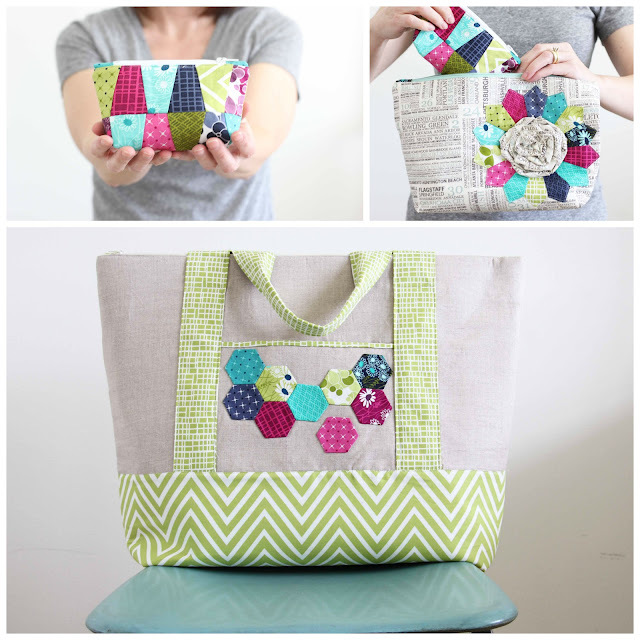 So I'm totally excited to introduce my newest bag pattern..But this time we went a little overboard! 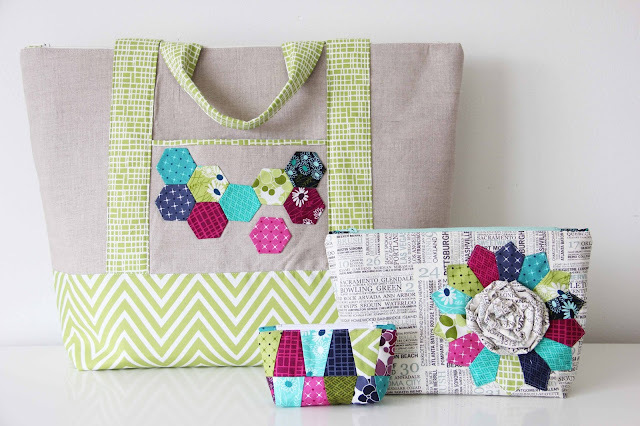 Small wedge zipper tote measures: 6"x3"
Medium dresden plate and 3D rossette zipper tote measures: 12" x 7"
and Large Zipper Tote with English Paper Pieced Hexagons on the outer pocket measures: 21"x16"x5"
This pattern not only includes how to make the cute small wedge zipper pouch perfect for your Aurifil thread and little embroidery scissors, but we also included how to make the middle sized bag embellished with a dresden plate and a 3D Rosette center with detailed diagrams, illustrations and pictures. 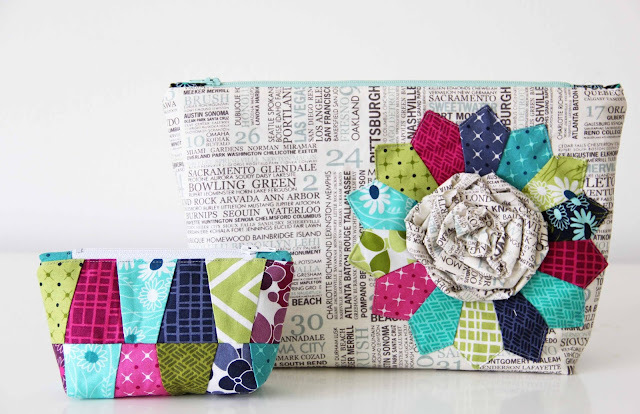 This medium bag is perfect for larger scissors, rotary cutters, templates and so forth. 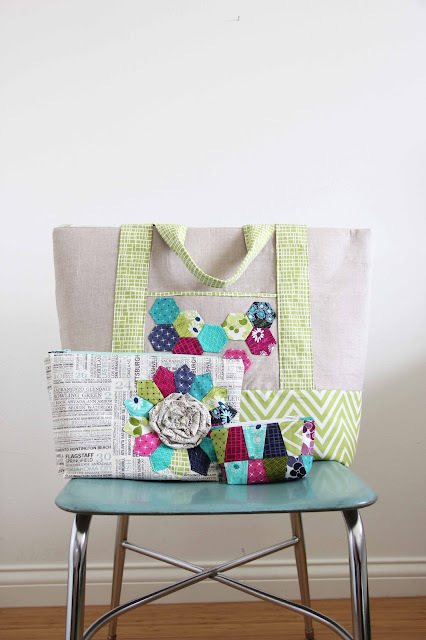 Then we also give you detailed step by step how to do the english paper piecing on the large tote. This tote is big enough to cary your portable rotary mat, rulers, and WIP's. Or use it to carry your feather weight! The handles are sewn on down the length of the bag and secured well that it can handle the heat of carrying your special friend…the sewing machine…not your actual friend! 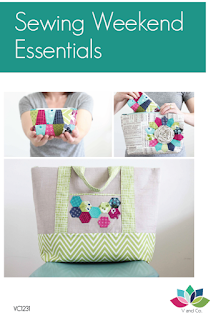 This pattern includes 18 pages of detailed instructions for each step on each of the bags and embellishments. This pattern comes in booklet form, with easy to follow step by step instructions, color illustrations, diagrams, and pictures. 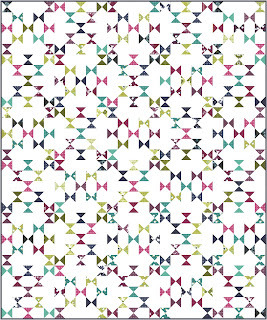 I would dare say: this is by far one of our best patterns. Sooooo Which one is your favorite?? Judge-y cat likes Butterfly Kisses here she's giving me the stink eye because I had the audacity to put a new collar on her and she is not amused with my asking for a picture. She's a snot. 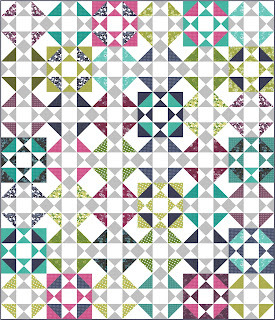 Butterfly Kisses is going to be perfect for a quilt I've been requested to make. 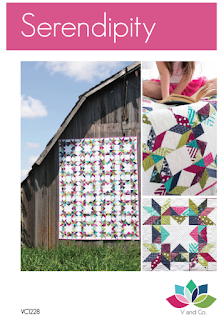 Couldn't resist and just purchased your four newest quilt patterns. 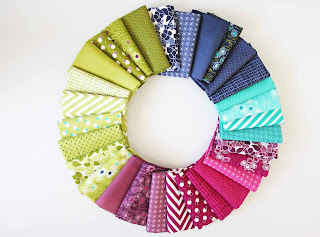 Luv, luv, luv your patterns and fabrics! 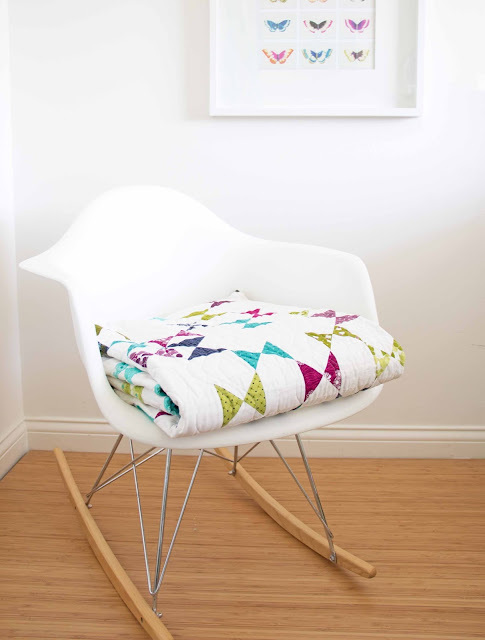 The new color line is gorgeous-- LOVE Butterfly Kisses-- I am wondering where the rocker came from that it is draped over? I NEED this in my Grandma's room!! love the Serendipity! Just gorgeous. Karen, I bought the rocker through Amazon, just type in mid century rocking chair and it should pop up!!! Oh man! Great job, V! I couldn't resist once again and had to go buy some patterns... I just love everything you do. Your fabric, patterns, and books make me swoon. I got my green book this week and I squealed like a little girl when I saw it came! :) Thanks for all your hard work and for sharing it with us, you make the world a more beautiful place!